King Harold had been named successor to the throne by Edward the Confessor. Unfortunately, he had also promised it to Duke William of Normandy. The Bayeux tapestry chronicles the battle that ensued and the eventual ascension of William as King of England. The original tapestry is not a tapestry at all, but embroidery. At 230 feet long, it is on public display at Bayeux Cathedral. “William Embarks” is just one panel from the larger work. 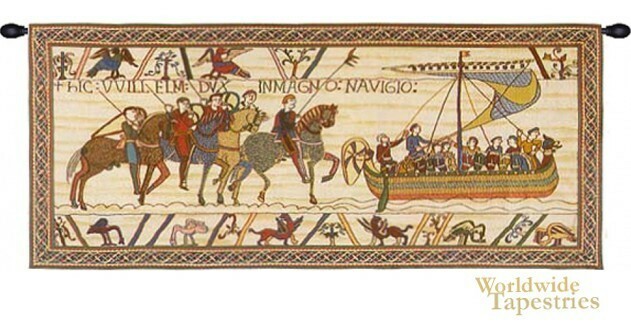 It shows William as he readies his armies to cross the English Channel to fight King Harold in the battle of Hastings in 1066. Even though it is a Norman document, scholars believe the English embroidered it. This tapestry is lined and has a tunnel for easy hanging. Note: tapestry rod and tassels, where pictured, are purchased separately. Dimensions: W 55" x H 25"
Dimensions: W 80" x H 36"